Live at the Teamsters Stage, Hats Off Day is proud to showcase three incredibly talented young artists: Stephen Scaccia, Chloe Farrell and Luca Fogale. These local singers will be taking the stage from 11:45am – 2:30pm. Combining music, theatre and comedy, The Myrtle Family Band engage and delight audiences of all ages with their porch stompin’, wash-tub bass bouncing jug-time traditional jazz, their twinkling-tap numbers and their on-stage family dynamic-antics! Willy Blizzard is riding a musical journey that remains true to their Canadian roots. Featuring John Hough, Fran Madigan and Andrea Laaw, the acoustic trio plays original music in the folk/roots genre featuring beautiful vocal harmonies, guitars, banjo and stand-up bass. V’ni Dansi is a Vancouver-based traditional Métis and contemporary dance company dedicated to sharing the dances, stories and culture of the Métis. Led by Artistic Director Yvonne Chartrand, V’ni Dansi is dedicated to preservation and innovation, and is thrilled to share the Métis people’s joyful culture with audiences of all nations. Blackthorn is a Canadian Celtic folk band, featuring four talented musicians, Rosie Carver, Michelle Carlisle, Michael Viens and Tim Renaud. The results of their collective musical backgrounds, skills and experience are witnessed in the high-calibre, entertaining performances they consistently deliver to audiences of all ages. Reid Jamieson is a prolific songbird who loves to sing. Now performing as an acoustic duo with his long-time songwriting partner and saucy wife, Carolyn Victoria Mill, they are committed to making music that matters. Hi-Yo and Long John (aka The Silver Brothers) will be performing their collection of folk-originals and folk-favorites for this great family-friendly communtiy event. Come by and enjoy some great songs, sing alongs are encouraged. 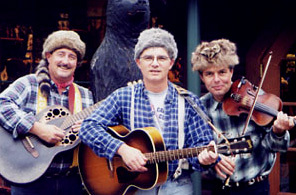 Celtic, Bluegrass, Canadiana and folk music are a specialty of the Mountain Men. This strolling band can do it all! The Mountain Men are Gordy Van and Larry Church with either Gary Comeau on fiddle or Tom Hiatt on accordion or all four if you like. Roland and Emma are a father-daughter guitar playing duo with a wide repertoire of family oriented music spanning the last 85 years. They perform throughout Greater Vancouver on a weekly basis, to audiences are as diverse as the music they play. The Well Worn Trail, made up of local storytellers Lillian Ireland and Rob Dramer, focus on sharing the magic of nature with children. Their program includes puppetry, songs and stories based on fascinating facts about animals and their habitats. Gabriel Mark Hasselbach is an award winning jazz stylist who plays a unique combination of trumpet, flute, flugelhorn, and valve trombone. In concert he walks a fine line between the classic and contemporary idioms incorporating both styles seamlessly.